Garmin dezl 560LT is designed especially for use in trucks, HGV's, motorhomes and other large vehicles. But it can also be used in cars, thanks to 4 different transportational modes! Simply input your vehicles size and dezl 560LT with route you along roads that are suitable for the truck, motorhome, HGV, etc you happen to be driving! The dezl 560LT features a large 5-inch touchscreen display and street-level road maps for 44 countries in both West and Eastern Europe. The 560 truck sat nav also comes with lifetime traffic - so you always know what holdups lie ahead too! Garmin dezl 560LT has been discontinued. Accessories, spares and parts are still available for your dezl 560LT as are street-level road maps. View the latest range of truck sat navs. With its 5-inch (12.7 cm) high-resolution touchscreen display, Garmin dezl 560LT provides a wealth of information in great detail. PhotoReal Junction View delivers a realistic reproduction of road signs and junctions along your route, with stunning landscape detail for exceptional clarity right down to the exact trees and pylons! With Lane Assist, theres no more guessing which lane you need to be in, dezl uses arrows to indicate the right lane for navigation at the right time - especially helpful when navigating complex motorway exits and junctions. So theres no need for panic, hesitation or last-minute lane changes, even on unfamiliar routes. Steer clear of traffic with Garmin dezls integrated FM traffic receiver and free lifetime traffic updates. Receive alerts about traffic delays and road construction that lie ahead on your planned route. Next, simply touch the screen to view traffic details or get an appropriate detour around the problem area. Garmin nuMaps Guarantee - simply register your new Garmin dezl 560LT within 90 days of first using your sat-nav to see if a free map update is available. See map coverage below for more details. Preloaded with detailed full Europe maps (44 countries, truck coverage may vary), for turn-by-turn directions and spoken street names, dezls specialised routing supports truck-related restrictions customisable by your vehicle height, weight, length and hazardous materials. Simply enter your trucks profile and dezl guides you onto suitable truck-verified roads, avoiding towns, cities and routes where relevant restrictions apply. You can even set up custom avoidances for specific roads and areas. Advanced multi-point truck routing finds the most efficient route between multiple stops and users can maintain various truck and driver profiles across a fleet, changing the active profile at any point. Garmin dezl 560LT includes nuRoute technology with trafficTrends historical traffic and myTrends predictive routing. trafficTrends automatically learns daytime trends for traffic flow to improve your routes and better predict your estimated time of arrival based on time of day and day of week. With myTrends, when you save your regular destinations in your “Favourites,” Garmin dezl 560LT will, over time, begin to predict where you’re going without you having to activate a route. Providing the most accurate time of arrival and best route based on relevant traffic information, whether you’re driving to and from work or a regularly scheduled weekly event, Garmin dezl 560LT helps you get there on time - no subscription or additional cost required. For hands-free calling, Garmin dezl 560LT integrates Bluetooth wireless technology with a built-in microphone and speaker. Just pair with your compatible Bluetooth phone and talk hands-free through the Garmin dezl 560LT. Simply dial numbers with dezl's touchscreen keypad to make a call. To answer calls, just tap the screen and speak into the microphone. Enjoy convenient one-touch dialling for your phone book contacts and points of interest and make sure you’re giving the road your full attention. Give a one- to five-star rating to any point of interest. Then once your unit is connected to your myGarmin online customer account, you can submit and share your ratings and receive an updated community database of other users’ scores. Save time by customising your device’s main menu to display your favourite and most-used icons for quick and simple navigation. Garmin dezl 560LT is portable and multimodal and easily switches from truck to car or RV/motorhome/caravan mode for taking with you between vehicles. Stay aware of safety cameras throughout Europe and travel safely, legally and speed-consciously. Every Garmin sat-nav has the full Cyclops safety camera database loaded inside to bring speed alerts - and only those specific to the road you are travelling and direction of travel. Keeping safe and accident-free will help you maintain lower insurance premiums and avoid penalty points and fines too. The Garmin dezl 560LT has been designed to be plug and play, and as such can be transferred from vehicle to vehicle with ease. The Garmin dezl 560LT is powered via the supplied vehicle power cable which includes an integrated GTM 35 Premium traffic receiver for real-time traffic updates. The Garmin dezl 560LT then sits on your vehicles dash via the supplied weighted Portable Friction Mount. Windscreen suction cup mount is also available and sold separately. Garmin dezl 560LT comes preloaded with detailed City Navigator street maps for the UK, Eastern and Western Europe (44 countries) provided from map supplier NAVTEQ. Rolling screen transition, accelerated map redraw and routing capabilities make screen zooming even smoother and ensure the navigation always matches your pace. If you'd like to buy additonal maps for another region e.g. North America or Australia and New Zealand. These can be viewed and purchased via the dezl 560LT map page. Looking for accessories and spares for the Garmin dezl 560LT? View the full range here. All parts are genuine Garmin product and specifically designed for use with the 5-inch dezl 560LT truck sat nav. 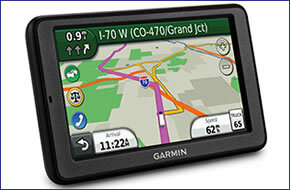 Looking for sat nav maps for the Garmin dezl 560LT view them all here. All mapping comes on microSD card with SD card adaptor and is a genuine Garmin product. Areas available to buy include: Southern Africa and Middle East and Northern Africa.